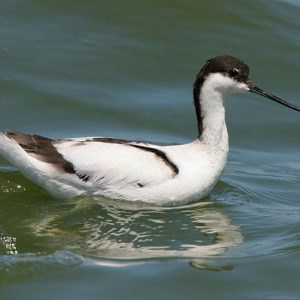 Large shorebird with black and white plumage and recurved bill. Occurs in flocks. Feeds in water 10-15cm deep, swinging head from side to side, advancing after each swing. Prey located by touch. Prefers small insects, beetles, small crustaceans, worms, gastropods, sometimes fish. Moves away from Knysna to breed.